Fresh fruit tastes even better when it’s dipped into this easy PHILADELPHIA Pineapple Cream Cheese Fruit Dip. This recipe is a keeper! COMBINE pineapple juice, sugar, corn starch and lemon juice in small saucepan. Cook over medium heat, stirring constantly for 5 minutes or until clean and thickened. SLOWLY stir some hot mixtue into egg. Return to saucepand and cook over low heat until mixture thickens slightly. Cool for 5 minutes. WHISK in cream cheese until smooth. Refrigerate 2 hours or until very cold. 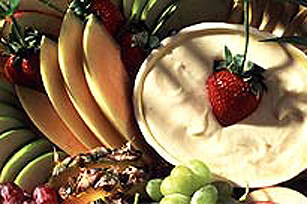 Serve dip in a dish surrounded by fresh fruit.